Landscape maintenance can be easy once you understand the needs of your property. Low maintenance landscaping is what everyone wants today. This type of landscaping can be done, but what you have to realize is that no landscape is no maintenance. There are some things that need to be done on a regular basis. The key here is regular. There is a rhythm or time to do certain routine tasks, so you can put together a basic schedule that can help you keep your landscaping in great shape. Maintaining your landscape properly keeps it growing in value for many years which also means it keeps your home looking its best too. This property has kept up with its landscape maintenance and it shows! It is a huge asset to this home's street appeal. This landscaping is welcoming to visitors driving by or walking up to their front door. 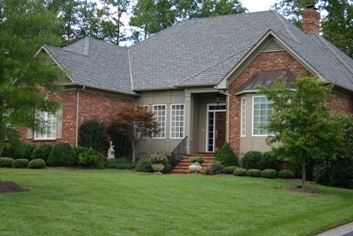 Ths lawn is beautiful, the shrubs are kept nicely pruned, the beds are mulched and have a crisp spaded edge. Developing the landscape plan is the first step in implementing your landscape, but it is also a helpful document for learning about and organizing the landscape maintenance of your property. In going through the landscape design process with me, you learn a lot about the various components that will make up your new landscaping. All the plant material is specified, so you see photos and learn about these plants prior to their installation. The structural elements of your landscape are treated the same. Once you know what material is best suited to your project, you can learn about it. You’ll know before construction what to expect it to look like and what the landscape maintenance of it will be. 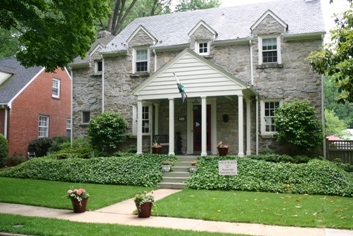 Once the job is built, the landscape plan is now a record of the plant materials and other elements of your landscape. It is a valuable source of information for the landscape maintenance of your property. I suggest that if changes in the plan are made during construction to take the time to document these changes on your landscape plan. This keeps the permanent record of your landscaping accurate, so you have a helpful reference for your landscape maintenance when needed. This beautifully maintanined landscape makes this house stand out in their neighborhood. I only made minor design suggestions to improve an already nice landscape that has lots of street appeal. There are shrubs only where needed to soften the house. The beautiful stone is allowed to show. A mass of English Ivy on the slope covers it well and the landscape maintenance has been decreased because you do not have to mow it! Clients are often overwhelmed by the landscape maintenance of the plant materials. Structural components are easier to understand because the manufacturer provides detailed literature for just this purpose. Landscape plants are a bit more complicated (they do not come with a manual), but there are ways to simplify the information you need to know in order to best take care of them. Believe it or not, you will have a basic knowledge of the plants used in your landscaping after going through the landscape design process. There are categories that landscape plants can be put in to help you learn best how to prune, water and fertilize them. Pests can cause a lot of damage to the plants in your landscape. Controlling pests is important to maintaining the optimum appearance and health of your plants. Plant’s foliage is used to produce food for the plant, so when it is eaten and weakened by insects, it no longer can produce food. The appearance is altered by damaged leaves becoming discolored, dying or disfigured which is unsightly in the landscape. Insects are not the only pest to attack the leaves of your plants. Deer and rabbits love to eat leaves and stems of certain plants. They can quickly strip a plant of its very necessary foliage. There are deer and rabbit resistant plants that can be used to help with this problem. Pests that eat or damage the roots of plants are very destructive. Moles and voles are the big culprits in Central Virginia. Moles create tunnels that push up the soil in your lawn. They are after the Japanese beetle grubs (their favorite food) that live underground. The disruption to the lawn’s roots causes damage to the grass as well as creates an uneven surface. Voles eat plant roots. I have been able to lift a full grown dogwood tree out of the ground because its roots were eaten off. 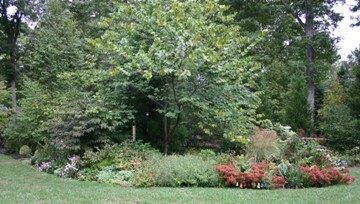 You may have also noticed this happening with daylilies and hosta. Sometimes the whole plant disappears into a hole in the ground. There are organic and chemical treatments for eliminating moles and voles. You should watch for signs of plant diseases and fungus. These symptoms can show up on leaves and branches. Diseases are varied with a wide range of symptoms. Look for an unusual appearance to your plant, like sap dripping down the trunk and malformed leaves and branches. The cooperative extension service for your area can be helpful for diagnosing disease problems, as well as other landscape issues. Disease can be specific to the plant, so looking up information about the plant can tell you what disease it is and how to treat it. Reference your landscape plan to find out the type of plant that is having the problem. Most fungus problems are on the leaves and can be controlled with spraying. Keep the mulch beds clean around the base of your plants to help keep some fungus diseases away. During the summer months, roses and crape myrtle commonly get a powdery, white mildew on their leaves. This fungus causes them to defoliate early which is an eyesore and weakens the plant. This perennial bed is designed and planted for easy landscape maintenance and optimum visual impact! Notice that the plants are organized in sweeps (organic shaped groupings that gently sweep to the next grouping of plants). This layout allows you to prune(deadhead old flowers)more quickly because they are not scattered around the bed. Planting in masses like this also makes a full display that is impressive to see and does not allow room for weeds. Weeding is a job most people detest. Unfortunately, it is a necessary one. Weeds compete with your landscape plants for water and nutrients and can overtake them if not controlled. You must realize that weeds are the native plants in your area. They may well be the best growing plant in your garden because of their adaptability to the environmental conditions. How frustrating, huh? Control weeds by mulching with a 3-inch layer of organic matter like shredded pine bark or pine needles. There are some pre-emergent weed control products for your mulch beds. They create a blanket over the soil that does not allow seeds to germinate. Keep in mind this aspect of how pre-emergent weed killers work, if you intend to plant any flower seeds in the bed. Weeds can also be controlled with herbicides that are used after the weeds appear. If using a chemical herbicide, choose one that decomposes quickly in the environment and will not harm your landscape plants. Vinegar is a good organic herbicide. Weeds can also be controlled manually by just pulling them. Remember, it only takes a small piece of the weed’s root system to be left behind to regenerate the weed. Herbicides are able to kill the entire plant. A successful landscape is designed to best suit your demands. There are so many different varieties of shrubs that there is no need to plant a tall shrub next to your house. This type of plant in this location is going to create a lot of work for you to keep it from overtaking the house. Drought resistant plants are available, if you do not have a good source of water for irrigation. Hybrids have been developed that are disease and insect resistant. I hope you realize the importance of the design phase. It helps you learn and understand all the many components of your landscape prior to installation, so you have the outdoors of your dreams and a landscape that is within your capacity to maintain. Do you have an old, overgrown garden that is overwhelming you and you do not know where to start? Please ask me for help with this landscape maintenance problem or any other landscape design issue you may have. I hope to be hearing from you! Please contact me to inquire about my landscape design services. Turn your knowledge into a website that generates income for you. SBI (Site Build It) is a powerful website creation and hosting system that shows you how it is done step by step. Take a look!